Home Care is a fabulous resource for health care services in the comfort of your own home. These services can be provided in a wide range of options from temporary care for an illness or injury to help for chronic longterm conditions. Since home care can be such a great option for patients and families, it’s important to understand how home care works and operates to see if it’s a right fit for you. What Do Home Care Services Include? Daily management of serious illnesses and conditions like cancer, diabetes, and more. Home health care is designed to help patients get healthy in a safe and comfortable environment. The goal is to help patients regain and increase their independence wherever possible. Home health care can also help manage and maintain chronic and serious conditions. Home health care requires a doctor’s orders. Once your doctors provides you a referral, you can talk with a home healthcare company. The home health staff will talk to your doctor about your care directly and also meet with you in your home. It’s vital that your home health staff see you as often as the doctor recommends. How Does Home Health Care Work With Insurance? While each insurance situation may be different, many Medicare health plans have coverage for some level of home health care. Check with your plan, or talk to our team to see what kind of coverage you or your loved one may be eligible for. 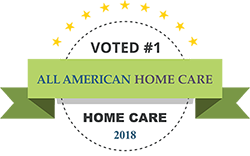 All American Care is the trusted home care provider in Pennsylvania and here to help you out every step of the way!